Theater folks love Halloween almost by default, what with all of the dressing up in fancy costumes. A witch makes a great costume, and it’s not a cliché if you do it right! Take these weird sisters, for example. The top pic is from our 2001 production of The Scottish Play, with (L-R) Andrea Stuart Calhoun, Rachel Hornor Barach, and Melissa Brooks cooking up a cauldron of badness. 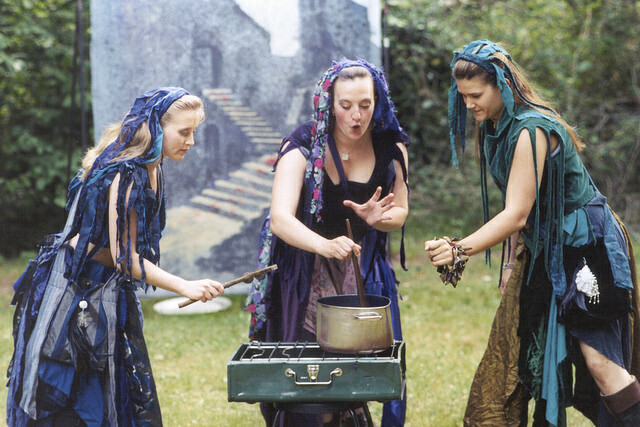 The lower photo is from our Backyard Bard Macbeth from 2010, with (L-R) Janet Cole Hamilton, Meredith Armstrong, and Sarah Budge Bentley conjuring up a powerful potion. We bring this up not only because it’s Halloween, and because witches are cool, but also to make a point, and that is that witch costumes can be pricey, as can eye of newt, toe of frog, wool of bat, tongue of dog, and a camp stove over which to give them a proper bubbling. Thus, we call your attention to GreenStage’s fall fund drive, under way now and running through Thanksgiving, by which we hope to raise $5,000 toward the preparation of our 2019 season, which will be our 31st. GreenStage is free but it’s not without cost, and we rely on our generous fans to make it all possible. Please DONATE TODAY!